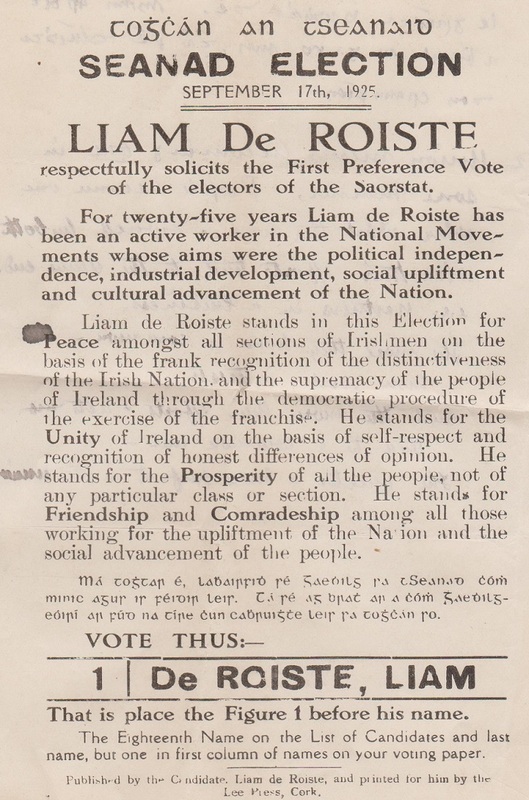 From the 1925 Seanad Election a Leaflet from Cork based Liam de Róiste, a former Sinn Fein TD/MP he served in the First, Second and third Dails. He did not stand in 1923 and stood without success for Cumann na nGaedheal in the June 1927 General Election. The 1925 Seanad Election was the only time that a portion of the Seanad was elected by General Franchise. 19 of the 60 seats were elected in 1925 with 76 candidates going forward , details here. The leaflet turned up in the Redemptorist Provincial Archive in Dublin, which has a Facebook Page which is well worth a look.